If you watched ‘Dynasties’, the new magnificent wildlife series with Sir David Attenborough, you would have noticed. You couldn’t miss it. There were some striking kicks, some intense hits, some very hard blows when a fight for leadership broke out. Chimpanzees are obviously a lot stronger than humans. They seem more muscly than people, but their extraordinary power is not only due to their quantity of muscle. Moreover, they cannot keep packing on the pounds of muscle, because they need to stay agile in order to be able to swing dynamically through the treetops. Scientists embarked on a search to find the secret to their superpowers. A mass of chimpanzee muscle can exert 1.5 times the amount of force as the same mass of human muscles! Previous studies that do not only test muscles, but also take into account the characteristics of tendons and overall build, found chimpanzees to be even 3 to 5 times stronger than humans. 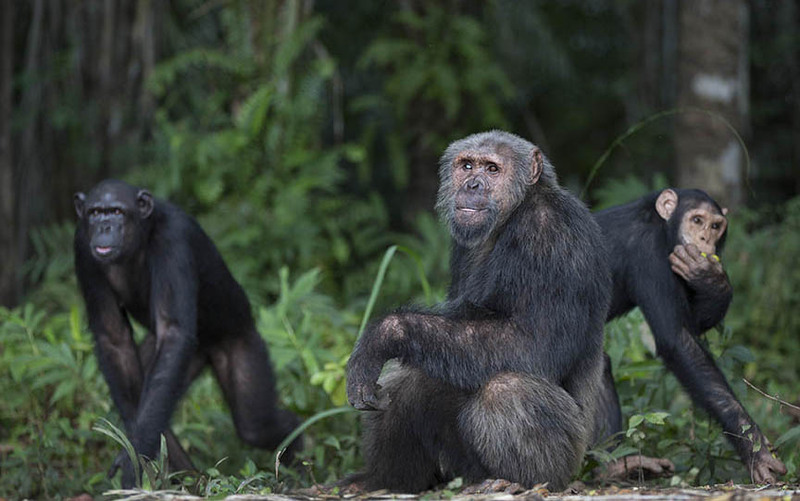 Matthew O’Neill and his fellow researchers found that chimp muscles have a higher ratio of specific variants of the protein myosin. Myosin is a motor protein that has an important function in contraction of muscles. Myosin binds strongly to actin to form muscle fibres. In muscle fibres, there are generally two types of myosin: type I (Myosin Heavy Chain I or MHCI) and type II (MHCII). Chimpanzees have a higher ratio, 67%, of muscle fibres that are made out of MHCII variants. These type II or ‘fast-twitch’ muscle fibres make for explosive strong power, while type I or ‘slow-twitch’ muscle fibres are fit for long endurance efforts. When computer models account for this difference, they generate a force difference between humans and chimpanzees of 1,35. Close to the estimated difference of 1,5. Short, powerful force by the fast twitch muscle fibres is an adaptation to the life in trees and movement through the canopy. As humans, with our higher ratio of slow-twitch muscle fibres, we are anyways capable of walking long distances. This superpower mystery has kept scientists from sleeping since the twenties. Finally, the truth is revealed!